Someone asked me this question last week and I immediately answered: “Meat Is Murder”. Why? What’s so great about it? Morrissey’s powerful voice and strikingly witty, dark-humored lyrics? Or is it the wonderful guitar riffs created by Johnny Marr’s irreplaceable genius? Or is it the peerless compelling sound of the band? All of the above, for sure. But these can be said about all The Smiths albums. Obviously, there’s something different about this recording that creeps into your mind very deeply. I’ll try to explain why I chose it from hundreds of beautiful albums and why it’s still strongly present in people’s consciousness today. 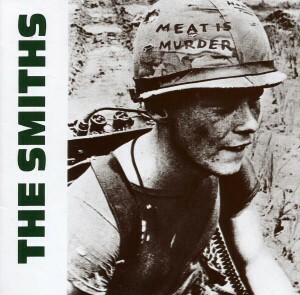 “Meat Is Murder” is a marriage of dark-humored lyrics about love, life, the violence born out of poverty & abuse with beautiful haunting melodies. As soon as you hold the record, you see the wording “Meat Is Murder” on Marine Cpl. Michael Wynn’s helmet. Political approach on the cover design is strong enough to shake you up emotionally. You get the sense that it is rebellious. The packaging itself is a work of art, and you know, even before you hear the music, that you are in for something very special. Curiously, you quickly put it on the turntable. The moment the needle touches the record, the wonderful opener “The Headmaster Ritual” gets into you with the exquisite guitar riff and the magic of the music does not leave you until the end of the last song. With its bovine cries and buzz-saw guitars, the album is different from everything you’ve ever heard: It makes you laugh with its perfect irony, it provokes you, and you suddenly have this urge to take action and go into the streets with banners proclaiming “Meat Is Murder”! Angered and saddened by the poetic lyrics, you also feel like you have found a friend whom you can put your head on his/her shoulder when you hoarsely cry or have met a kindred spirit who can hear you when he/she sleeps. One thing is certain: after listening “Meat Is Murder”, your life is not what it used to be anymore. In the 80s, this record was like a manifesto and also a solace for unruly angst-ridden teenagers who wallowed in the melodrama of youth. Musically, it is adventurous and energetic with Johnny Marr’s rockabilly guitar styling. It is a rewarding batch of songs. But what makes the album powerful is its psychological realism—the way it echoes the feelings of alienated poor teenagers is so devastatingly accurate that it hurts. As the greatest lyricist of our time, Morrissey uses songs to explore the underlying struggle of human life, romantic desires, family relationships, sexuality, gender, and the misfits of society in painstaking detail. “A double bed, and a stalwart lover for sure – these are the riches of the poor,” is one of the best song lines ever written. “That Joke Isn’t Funny Anymore” and “Well I Wonder” might plunge you into despair in their own charming ways while “Barbarism Begins At Home” surprises you with Andy Rourke’s fantastic funky bass work. Daryl Easlea of BBC once wrote of the album, “Whichever way you assess it, however, there was no other British group making music quite like this in 1985.” I go further and declare this: 30 years on and still there’s no other group making music quite like this. When I heard the song “Meat Is Murder” for the first time, its frankness hit me hard and opened my eyes. It was an awakening for me. I stopped eating meat because of this song and then went vegan. This is why, after all those years of listening to The Smiths, it is still a thrill to hear this heart-rending song. I have always been fascinated how the band stood up bravely for animals and gave an honest opinion on this taboo subject. “The flesh you so fancifully fry is not succulent, tasty or kind / It’s death for no reason / And death for no reason is murder,” sings Morrissey and I crawl into the deepest corners of my soul to hide from this cruel world. Do I manage to hide from it? Sometimes yes, sometimes no… But I am comforted in knowing that there will always be a friend (“arkadaş” in Turkish, as Morrissey said at his Istanbul gig in December, 2014) accompanying me on my darkest journeys. This honest friend was born in the shape of a vinyl record in 1985 and it is called “Meat Is Murder”.